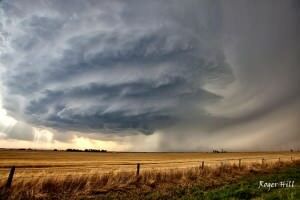 One of my favorite weather photographs is storm structure. 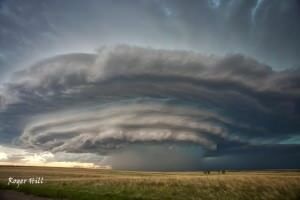 Sometimes, the structure of a supercell thunderstorm can be mind-boggling and quite breathtaking. 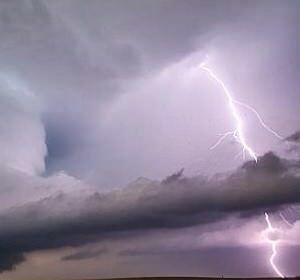 From the appearance of a barber pole spiraling into the atmosphere to the look of a craft from outer space, a supercell is definitely the most interesting storm to shoot. These storms can be quite violent; and precaution must be taken, so you do not put yourself in extreme danger. 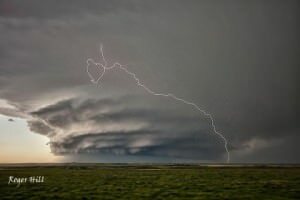 During my 27 years of photographing and filming thunderstorms, the supercell has given me the most opportunities for amazing photography…and will for you too. Since these storms usually move in an easterly direction (although they can vary to the northeast and southeast! ), it is best to position yourself downwind (east) of the storm. The greatest hail and lightning threat is closest to the downdraft of the storm, which is where the streaks of rain/hail are falling. This is usually 2–5 miles from the updraft tower. Positioning your camera to the southeast of this area affords the best opportunity for storm photography. In each image in this article, I was in exactly that position, with the results being quite striking. You must be careful to balance light with the storm structure, as a slightly overexposed storm will bloom any light filtering around the storm. Underexposing this light will make your storm’s structure too dark and lessen the effect. Delicate experimentation will help you find the right balance. If you have a camera with a “live mode,” then try using it to see what your sensor sees. It helps tremendously. Proper equipment is also a key to successful storm photography. I use a Canon EOS 5D Mark II, with 3 “L” series lenses, the 16–35mm f/2.8, 24–105mm f/4 and the 70–200mm f/2.8 IS. When shooting the storm’s structure, positioning yourself 5–8 miles from the storm’s updraft region will require a wider lens, thus my lens of choice in this situation is the 16–35mm f/2.8. Also, pay close attention to the storm’s motion. You never want to be caught in a position you can’t easily escape; and always park safely on the side of the road with plenty of distance between your vehicle and moving traffic. Give yourself plenty of options to avoid any harm or injury. Mount your camera to a tripod if possible. 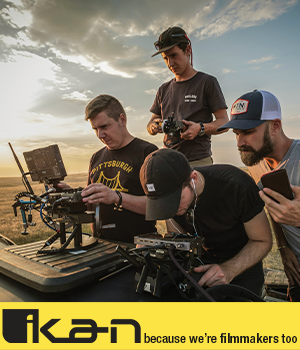 Then, use a shutter release cable or wireless device since your shutter speed must often be long to capture enough light and render the colors correctly (or increase your ISO as much as needed). Even the slightest motion when releasing the shutter will cause blurriness in your images. Remember air is flowing INTO the storm (to your back) and can also cause some movement in your camera, let alone blowing dirt and dust towards the storm. Protect your equipment at all times and never leave your camera and tripod unattended! If capturing lightning while photographing a storm is your goal, then there are a couple of different methods that can work successfully. Use an ND (neutral density) filter to slow your shutter; however, this will cause some blurriness to images due to the long exposure. Your camera’s continuous-shooting mode works best in this situation, which, if lightning is frequent enough, will capture numerous strikes. Another superb way to capture lightning with a storm structure during the daylight is to use the Lightning Trigger (www.lightningtrigger.com). This uses a photocell that triggers your shutter release every time an electrical discharge occurs within a storm. The key here is to slow your shutter speed enough to capture the return stroke from a bolt. Otherwise, nothing has the speed to catch it. I’ll discuss the use of the Lightning Trigger and other methods of capturing lightning in the next article. Look for it in a couple weeks! Other equipment you should have with you when photographing storm structure is a cloth for wiping dirt and/or raindrops from your lens, a small flashlight as twilight and darkness approach, and a rain cover or other shelter to protect your equipment from adverse conditions. Also, watch for rodent holes, snakes and insects, as these creatures can certainly put a damper in your photography plans. Photographing a storm can be very exciting and rewarding. It can also be quite dangerous. Please consult an expert before storm chasing, or accompany an experienced weather photographer or meteorologist. With safety in mind, and the proper equipment, your digital photography adventure can be a very memorable one. In the next article, we will explore photographing lightning during daylight and darkness. Stay tuned! For more information, visit Roger and Caryn Hill’s Websites: www.stormchase.net and www.southwestphotographytours.com for many more exciting images and photo workshops!